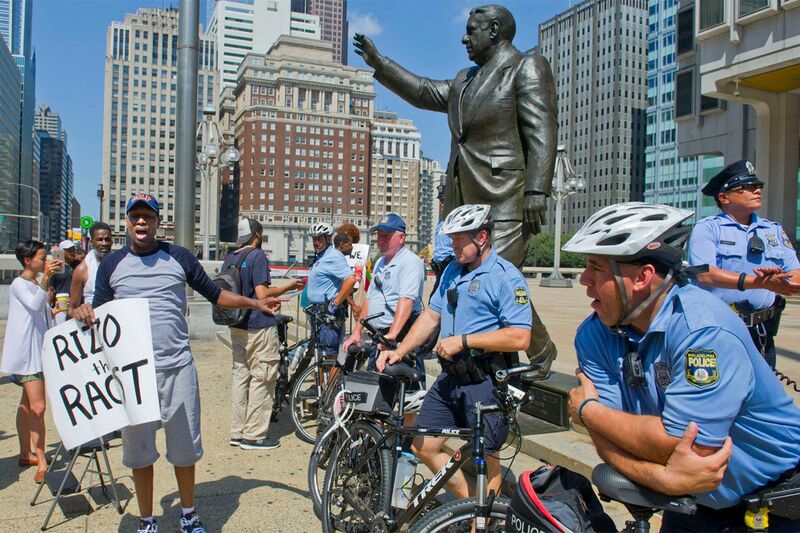 Black Lives Matter member Asa Khalif berates officers after a Klan hood he placed atop the head of the Frank Rizzo statue was removed outside the Municipal Services Building. Editor's note: Michael Smerconish wrote this column in August 2016, when protestors called for the removal of the Frank Rizzo statue. We've republished today as the events in Charlottesville, Va. have inspired more debate about the monument. A winter snowstorm hammered Philadelphia on Feb. 23, 1987. I'm not normally a horoscope person, but for some reason I saved my Pisces directive that day: "You'll have reason to celebrate. . . . The boss recognizes your value." I'd like to think that was true. It was my first day working for Frank L. Rizzo. Due to the weather, I was the only staffer who made it to work. For me it was easy. I lived in a small studio on Rittenhouse Square and needed only to walk three blocks to 1528 Walnut St. Either Anthony or Joe who managed the building let me into Suite 2020, where I sat in the outer area reserved for visitors to the former mayor. Despite the snow, the telephone that ended in "1987" started ringing. And I remember the first call that I answered. It was a woman from the Northeast whose block was debilitated by the weather. She wanted her street plowed and she was calling Rizzo. It mattered not that he hadn't been in City Hall for seven years. That first day was typical at the campaign office. For the next nine months, I was constantly at his side. My business card said "Political Director," but my role was often that of body man, especially when he crisscrossed the city at night making campaign appearances in his run for mayor. That meant attending to the candidate's personal needs and also serving as a buffer in his public encounters. If there was one constant every night, it was that people would seek his assistance. Potholes, broken streetlights, trash-strewn lots. Jobs - always people asked for work. Abandoned automobiles, lack of police patrol, missing dogs. Yes, lost pets. You name it, people asked for his help. They'd make verbal requests that I'd notate or they would stick handwritten notes in one of his enormous hands that spelled out their problem and included a telephone number. Rizzo would pass the notes to me for safekeeping, and I'd return them to him the following day in the office. He would seek to match the need with friends he still had at all levels of city government. No matter the nature of the problem, he always tried to help. Here's something else that might surprise: If someone called the City Hall switchboard after he left office and asked for Rizzo, the operators would connect the caller to his house in Chestnut Hill. I know. I not only reached him that way, I also sat at his kitchen table on Crefeld Street and watched him accept those redirected calls. Which is why I've always seen the Municipal Services Building as the ideal home for his statue. It's the building that houses so many who are responsible for the delivery of city services. The added attraction for the location was that Rizzo's first mayoral office was in the MSB, and that vantage provides a vista for his likeness to look fondly across the street toward City Hall. Some originally believed the police Roundhouse to be a natural, but I disagreed. While for some his public persona will always be that of the patrolman who rose through the police ranks and became mayor, the Frank Rizzo I knew was 16 years removed from the department, and with the city's turbulent past behind it, his primary focus was on the unglamorous task of meeting basic needs. A few months ago, I heaped praise upon Rizzo, a play by Bruce Graham then running at Theatre Exile in Old City. It was based on the book Frank Rizzo: The Last Big Man in Big City America by Sal Paolantonio. I noted just one criticism: "Missing, for me, in the play were sufficient illustrations of what made him tick, what gave the man big enough to wear a size 52 'long' suit his greatest personal satisfaction - helping people and improving the city he loved." The effort to remove the Rizzo statue from its current home is part of a national attempt to rewrite history, especially on matters of race. This has been particularly true on college campuses. When some sought the removal of Harvard Law School's seal because it was tied to a slaveholding family that endowed the school's first professor, the university president, a Civil War scholar, said something that applies to many of these debates. "I feel quite strongly that we should not be trying to erase our history of names," Drew G. Faust told the Crimson. "I think we're all going to be facing these questions, and the case that I would make is . . . about the importance of sustaining our history, not erasing it." She's right to argue that it's better to understand this type of symbolism in context, rather than change memorials in a manner that seeks to alter historical legacy. There's been no new revelation, no new finding regarding the Rizzo record since the statue was erected in 1998. If new information had come to light about the man or his actions, this might be a reasonable debate. At least when they removed the Joe Paterno statue outside of Beaver Stadium in Happy Valley, it was as a result of former FBI Director Louis Freeh's concluding that the longtime coach probably knew about Jerry Sandusky's sexual abuse of children. "The black community would rather see representations of the great contributions made by African Americans and other people of color to this city's development. These statues should be erected in place of the constant representations of Christopher Columbus, war heroes, Frank Rizzo, and others who have held communities of color in subjugation." Moving Frank Rizzo isn't appropriate. Better that he continue to stand where he is, and that his legacy be subject to civil debate rather than an erasure of history. Michael Smerconish can be heard from 9 a.m. to noon on SiriusXM's POTUS Channel 124 and seen hosting "Smerconish" at 9 a.m. Saturdays on CNN.